This grey and wet January has me dreaming of a trip to Palm Beach. And as I can't leave my 12-week old puppy, a trip through the interwebz will just have to do! The power of paint. We talk about it all the time. From a plain white box, to an swirl of color an detail, expertly applied paint can absolutely make a home. The Palm Beach pied-a-terre of tropical design queen, Amanda Lindroth is a testament to fabulous painting. With a stunning trompe l'oeil living room painted by super dashing British artist, Aldous Bertram (follow him on Instagram for his work, stay for his dream boat-ness), Lindroth's home is an old-school confection. Coral-orange leopard print walls greet you in the foyer. And, yes, here it is. This double-height, white box of a living room was completely tranformed, like Cinderella and Fairy Godmother style, by Bertram's gorgeous painted walls. A pale sea green-aqua is the perfect backdrop for swirls and swirls of faux millwork, mouldings, plasterwork, and blue and white china sitting on corbels. This once-plain room had only white walls and those mirrored shelves. Bertram's faux blanc de chine surround is at once light-hearted and substantial. Adore the faux Japanned head-and-shoulders panels above the door, and, of course, the friendly tropical bird perched in the back corner (painted bird = no poop!). Slipcovered, bamboo, and rattan chairs provide a casual counterpoint to the grand walls. Similarly the wicker basket central pendant light provides a lot more levity than a formal chandelier or lantern would. This beefy, pedimented, limed oak cabinet is a gorgeous combination of a classical shape and them combined with a breezy, warm-weather finish. Much like the apartment itself. The faux demilune above it with a clamshell motif is divine. I mean, I could die. Also, props on the faux marble obelisk. 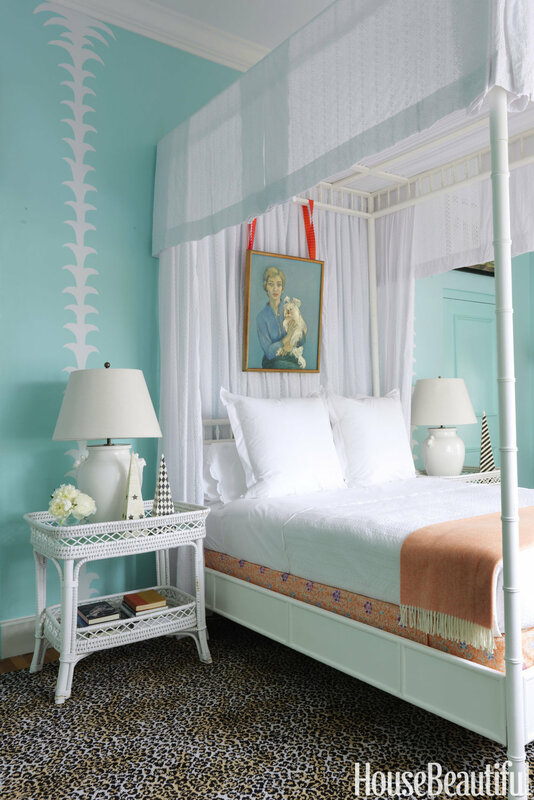 Lindroth's master bedroom is at once elegant and cheeky with its crisp turquoise walls and fabby leopard carpet. This black rattan lounger matches the bench in the foyer. The simplicity of the window treatments is fresh and grounding. Lindroth's daughter's bedroom is a chic take on traditional Palm Beach pink-and-green with fleshy blush walls and emerald green linen drapes and bedskirts. The contrast tape on the walls is so simple and so effective. Also, quick plug there for Lindroth's devastatingly cute straw market bags. Yes, I love bamboo everything, and oh yes, does this home deliver. I highly suggest you go see the original story over at House Beautiful, as they have shots of the plain, white box this home was before Lindroth and Bertram were let loose on it. The tromp l'oeil craziness of this home is so pitch-perfect for a Palm Beach pad. Its got that extremely rare quality of being light-hearted and expertly executed that really gives you a smack in the face (in the best, most needed way). The fabulous home is at once a celebration and a good natured send-up of the grandiosity of this fabled town.